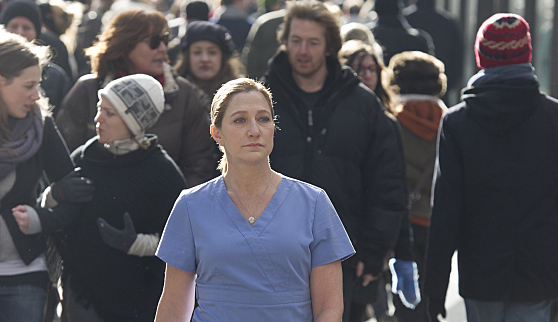 Last night’s series finale of Nurse Jackie left viewers unsure of whether the title character lived or died. (Spoilers ahead.) Everything was looking rosy for Jackie Peyton but, at the party for her closing All Saints Hospital, she overdosed and it wasn’t clear if she’d survived or not. Phillips shared that Nurse Jackie was initially going to end very differently. There would have been a fire that breaks out in the ER in the finale. Jackie would have braved the flames to free an addict that had been handcuffed to a hospital bed in the basement. It would look like she’d perished in the flames but viewers would then see her squeeze out of a tiny window — like a birth. She would start running down an alley, toward a crowd of staffers, but then she would decide to turn around and run the other way. She would be a free woman, able to start over. Ultimately, it was felt that the blazing ending wouldn’t have focused enough on the character and her addictions. What do you think? Do you think Jackie lived or died? Did you like the shows ending? Producer was a lazy jackass. Could have finished the fkn searies. Most Bull **** ending I’ve ever seen. I feel like she died because they made it a point of saying they had closed early for the night because they were totally out of meds, with all the drugs she took the amount of narcan the ambulance workers would have had on them would not have been enough, its just another selfish move on the characters behalf with her daughters conformation being the next day. It was a good way to end it seeing how everything was always about her. I’m pissed really like this show!!!! I loved this show but found myself yelling “DIE ALREADY” when her drug abuse obviously wouldn’t stop and she was hurting so many people. I think she died in the end, an appropriate ending to someone who had no real desire to stop. I for one was glad to finally see her die! She caused so much pain to everyone around her. She was exhausting, everything out of her mouth was a lie. How many chances can you get before you ruin every relationship and child in your life? There are consequences, no one escapes them. Now, finally there can be healing for those she used & destroyed. I Loved Nurse Jackie through the 6th Season….Season 7 Nurse Jackie “Jumped the Shark”; and I really was hoping it would end sooner….